This recipe is perfect for this season. 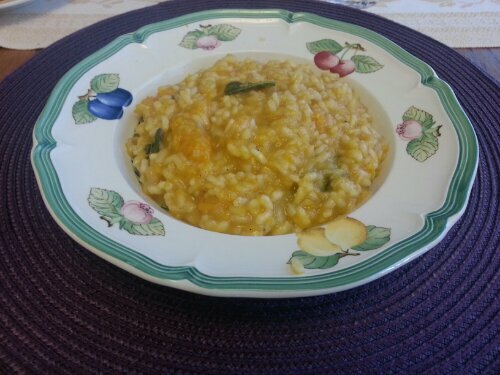 As a base I used shallots and roasted butternut squash, and added sage, nutmeg and black pepper as accents. I used extra virgin olive oil instead of butter, to make it a low-cholesterol recipe I also used home made vegetable broth, which I made in advance and kept in the fridge. Clean the butternut squash and cut it in small cubes. Bake it at 400F for 25 minutes. Prepare 2 sauce pans one with some vegetable broth and one with water and keep them hot on the stove. Chop very finely the shallot and put it in the pot with the olive oil. When the oil is hot add the sage. Cook for about 5 minutes. Add the baked butternut squash and cook for few minutes. Add the rice and stir until warm. Keeping the flame on high, add the wine and let it evaporate. Return the flame on medium. Add some vegetable broth and salt. Cook the rice for 20 minutes stirring and adding the broth and the hot water a bit at a time. The rice should be kept constantly very moist. At the end it should result very creamy. Half a way through the cooking time add the grated nutmeg. Five minutes before ready add the black pepper. When ready turn off the stove and add the grated Parmesan cheese. 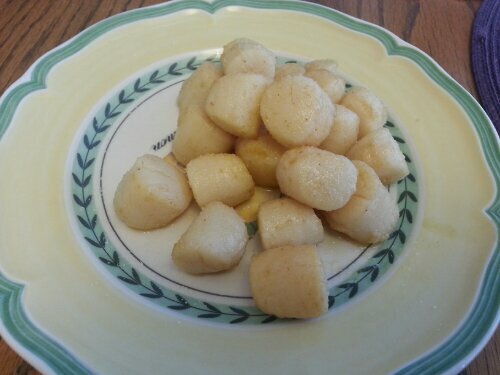 It pairs very well with Bay scallops, which are in season right now, simply dusted with flour and sauteed in butter.